Make the crust: Coat a 10-inch springform pan with cooking spray. Mix wafers, sugar, butter, and salt in a medium bowl. Pat mixture into pan, pressing firmly into bottom and all the way up sides. Cover, and refrigerate until ready to fill. Make the ganache: Place chocolate in a food processor. Bring cream to a simmer in a small saucepan, then pour over chocolate. When chocolate begins to melt, process until smooth. Reserve 2 tablespoons ganache for decorating, and spread the remainder evenly on bottom and all the way up sides of crust. Cover, and refrigerate until ready to fill. Make the filling: Beat cream cheese with a mixer on medium speed until fluffy, about 3 minutes. Reduce speed to low, and slowly add sugar and salt. Raise speed to medium-high, and beat until very fluffy, about 3 minutes. Beat in lemon juice. Whisk cream until medium-stiff peaks form. Whisk 1/4 of the whipped cream into cream cheese mixture, then fold in remaining whipped cream. Pour filling into crust, and spread evenly. Gently tap bottom of pan on counter to release air bubbles. Transfer reserved ganache to a pastry bag fitted with a 1/4-inch round tip. Starting in the center of the cheesecake, pipe a spiral, spacing lines about 1/2 inch apart. Pull the tip of a paring knife in a gently curved line from the center of the spiral to outer edge. Wipe knife clean, and repeat every inch or so to form a web. Cover, and freeze for at least 1 hour or overnight. 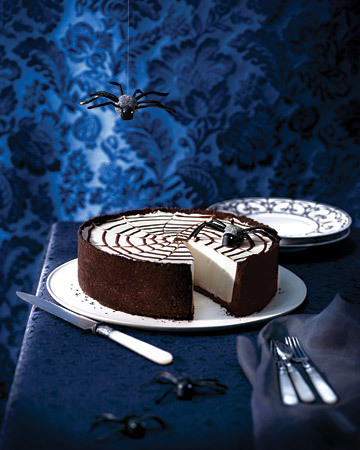 Unmold cheesecake, garnish with candy spiders if desired, and serve immediately. Hi, I’m J.S! I live in California with my husband and our dog, Daisy. Recently I’ve felt like something was missing in my life- like I let the world swoop me up and I just stopped being creative. This is my attempt to get back to what I love, to find happiness in everyday things and to do it within my means. Halloween in the new house! !